MEIS Roofing & Construction offers high quality, professional residential commercial roofing and construction services throughout DFW, North Texas and beyond. Leaks are some of the most common and devastating roofing problems out there, so if you are experiencing a roof leak, or if you’re unsure about the potential for a leak, contact MEIS Roofing & Construction. Our residential roofing leak detection and repair team uses the latest in technology, including thermal imaging, to find and repair leaks fast. 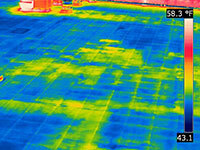 Thermal imaging allows our roofers to seek out leaks in tough-to-reach places, ultimately providing pinpoint accuracy. Once we’ve identified the exact location of the leak, our experts use advanced roofing products to easily and permanently put a stop to it. Each one of our roofers has been thoroughly screened prior to joining our team, and we only hire experienced experts who are dedicated to customer service. If a leak is detected, we’ll provide you with all of your repair options before any work takes place so that you can make the decision that’s best for your home. Once we’ve worked with you to find a solution that meets your needs, our team can usually complete all of our residential roofing repair services on the spot. Once our residential roof leak detection and repair team has resolved your leak, we recommend that you partner with MEIS Roofing & Construction for our residential roofing maintenance services. Our roofers can work on your schedule to ensure that your roof remains protected all year long. We’ll inspect key elements of your roof, including your shingles and supports, and if any problems are detected, we can correct them before they become a big deal. We can also recommend roofing products that are personalized to your unique home. Additionally, you’ll always be given a full report detailing all work that was completed and any recommendations that you’ve been offered. The exact cost for a roof leak detection inspection will vary depending on multiple factors, which our roofing technicians will determine upon examining the roof itself. For example, the size of the roof will play a factor in the overall cost for an inspection. The larger the roof, the more the job may cost. With that said, MEIS Roofing offers affordable services to homeowners in the area for quality service. On average, many homeowners pay anywhere between $300 and $1,000 for roof repairs following a leak inspection. For the actual inspection, you should not expect to pay any more than that. Finding the leak is difficult to the untrained eye, but these experts perform roofing jobs and leak detection on a regular basis. If you’re interested in our prices for roof leak detection inspections, call for a consultation today. We’d be more than happy to work with you to meet your needs at home or in the office. How Can I Find the Area the Roof Is Leaking From? Your home was a major investment, so it makes a lot of sense that you would like to protect said investment from a serious leak or water damage. Most leaks stem from the roof above your head, but with an attic in-between, finding the exact point of the leak can be almost impossible if you’re unsure of exactly what to look for in the first place. 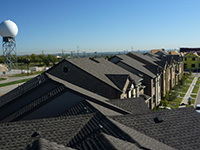 To start, examine your roof uphill from where the stains are forming from water damage. You should look for any roof penetrations – holes or cuts in the roofing material. 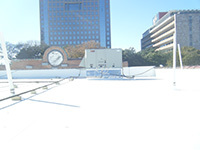 An item penetrating the roof tends to be the most common reason for a roof leak. If you have attic access in your home, finding the leak just got a lot easier to accomplish. You will notice water stains, black areas, or mold growth in specific spots. These specific factors can help determine exactly where the leak may be coming from. A leak in your home’s roof may not be immediately evident. In fact, whatever water is dripping in through a crack or crevice may simply begin to grow mold in the attic instead of making any water itself noticeable. The telltale signs of a roof leak, however, are missing shingles viewed from outside, a water stain, or the walls beginning to expand from the water running down the interior. A water stain is the most common sign of a roof leak. The water may appear as a large puddle on your ceiling. This puddle is often ringed with brown, making it quite easily spotted. Missing shingles are one of the most common causes for a roof leak. You may notice the shingles themselves or bits of debris in the downspouts. Both signs point to trouble up above. Be sure to inspect your home once in a while and check the roof for any signs. How soon can you come out to locate my leak? Our experienced roofing technicians are available any time of the day or night for roofing repair emergencies. If you are worried about significant damage to your ceilings, walls, or attic due to a leak in the material of your roof, give us a call as soon as you notice the problem. We will work with your schedule to send a roofing technician to your residential property as quickly as possible to rectify the problem. Once there, our roofing specialists will determine exactly how bad the problem is before forming a clear plan of attack to rectify the issue. More often than not, a roof leak can be fixed rather easily. The timeframe all depends on exactly how big the actual leak may be and what damage it has caused. Don’t allow a roof leak to become a bigger problem. At the first sign of trouble, contact the residential roof leak detection & repair team at MEIS Roofing & Construction by calling 866-211-1116. Appreciate all the time and effort by Freddie, quality roof. Thank you for all your hard work. We will definitely recommend you guys! The roof and gutters look great. Great Job! The crew worked very hard and fast! I love the look of the new shingle pattern.